Prostate Cancer 20/20 – Andrew Siegel, M.D. Dr. Siegel’s newest book is comprised of three-parts, written for newly diagnosed patients and their families. It is also intended for those patients who require secondary and tertiary treatments after failure of primary treatment and for those encountering urinary and/or sexual issues following treatment. Although the book is authored by a urologist, the foreword is written by a radiation oncologist—Dr. Louis Harrison, Chair of Radiation Oncology at Moffitt Cancer Center, Tampa, Florida—in line with the author’s objective of an unbiased and multi-disciplinary approach to prostate cancer management. WHY READ PROSTATE CANCER 20/20? Prostate Cancer 20/20 is a streamlined, practical, accessible and trustworthy resource to help patients and their families navigate through the formidable process of diagnosis and management. In Part I, all management options and their pros and cons are reviewed fairly and objectively. The unprecedented number of recent advances in prostate cancer diagnosis and management are detailed. These include: improvements in screening and diagnostic testing, preventive measures, bone health, increasingly sophisticated imaging techniques, the development of genomic and genetic testing, the blossoming of the era of “active surveillance,” continued technical advances in surgical, radiation and focal therapies, and the availability of a host of new medications for advanced prostate cancer. Because most patients with prostate cancer have an excellent prognosis, the long-term consequences of the disease are often the side effects of treatment; Parts II and III review the urinary and sexual consequences of prostate cancer treatment, respectively, and the means for managing them. The book is a collaborative effort with input from the following healthcare professionals: Dr. Siegel’s urology partners (Dr. Chris Wright, Dr. Thomas Christiano, Dr. Gregory Lovallo, Dr. Mutahar Ahmed, Dr. Michael Esposito, Dr. Martin Goldstein, Dr.Vincent Lanteri), radiation oncologists (Dr. Louis Harrison and Dr. Glen Gejerman), medical oncologists (Dr. Robert Alter and Dr. James Orsini), a urologist with expertise in high intensity focused ultrasound (Dr. Ivan Grunberger), a radiologist with expertise in multiparametric prostate MRI (Dr. Rob Waxman) an anatomical pathologist (Dr. Stephen Peters), a sexual educator who is the president of the E.D. foundation (Paul Nelson), and a pelvic floor physiotherapist (Niva Herzig). For the newly diagnosed patient with prostate cancer. For the prostate cancer patient who has failed primary treatment and requires secondary or tertiary treatments. For the patient with urinary and/or sexual consequences of prostate cancer treatment. For family members of patients with prostate cancer. You’ve covered the entire waterfront! And, most importantly, you’ve covered it extremely well. Hopefully this will be a paperback that can be ordered in bulk because I think that it’s really something that all patients, those with questions about screening, active surveillance, management strategies, the meaning of their biopsy results, and also the more advanced “stuff,” prognostic testing, genetic testing, CRPC, etc., would want to read, because it is easily understandable, extremely well written and manageable. 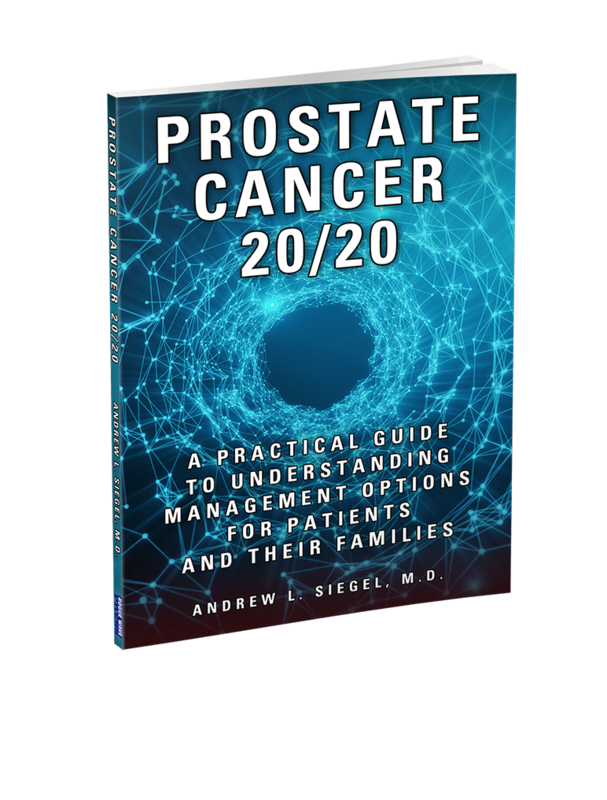 Dr. Siegel's Prostate Cancer 20/20 is an excellent resource for prostate cancer patients and their families. It is a robust but easily understood work on every aspect of the disease- from basic anatomy, to initial diagnosis, through the multiple and confusing options of treatment, and finally management of treatment related side effects. I encourage all of my patients to read this well balanced thoroughly researched and unbiased explanation of the various modalities that can be used to cure Prostate Cancer. Section III- Sexual Function is an outstanding explanation of the physiology of erections, why aging leads to erectile dysfunction, and innovative techniques to remedy erectile dysfunction- this should be required reading for all couples over 40 years old. Kudos Dr. Siegel! This is an overall excellent read. The topic is thoroughly covered with no stone left unturned, but at the same time, it is concise and understandable (even given the complexity of some of the new medications and treatments that are dealt with in considerable detail). Although the book is intended for lay persons, it is complete and up to date to the extent that medical students, residents and even practicing urologists such as myself will find it to be a useful, reliable and handy resource. Very authentic and useful book. Well written in a very clear and concise way. It is an excellent asset for patients as well as for health care providers. Must read for any lay person (and many physicians I might add) who want a clear, concise, informative book about the diagnosis, management and treatment of prostate cancer. As a prostate cancer survivor, I wish I had this when I was going through it! Not only does Dr. Andy talk about treatment options, he includes the discussions about side effects that other sources tend to minimize. Every man who is given a prostate cancer diagnosis should be given this book...as well as their partners involved in their decisions. This is the most up-to-date writing on this topic. Give this book to anyone you know facing treatment decisions! People speak often these days about the phenomenon of 'fake news' but it's not until you or your loved one is desperate for sensitive, timely information does the challenge of sifting through the many disparate voices bring the issue home. Dr. Siegel's book is clarion call of guidance regarding prostate cancer. Professional yet empathetic - someone who has walked the walk with his physician father - he guides the reader through an increasingly complex maze of issues. It's not all simple reading, this is cancer after all; however, in one rather condensed book the uninitiated can better understand and be ready to partner with their health care professionals as they navigate time bound choices related to their cancer care. Prostate cancer is prevalent, the statics shocking; it is the male breast cancer. Suffering patients and their loved ones shouldn't have to hunt and peck for information - and hope - regarding care.